This topic describes how to customize role-based access control (RBAC) in Ops Manager. Use RBAC to manage which operators in your organization can make deployment changes, view credentials, and manage user roles in Ops Manager. 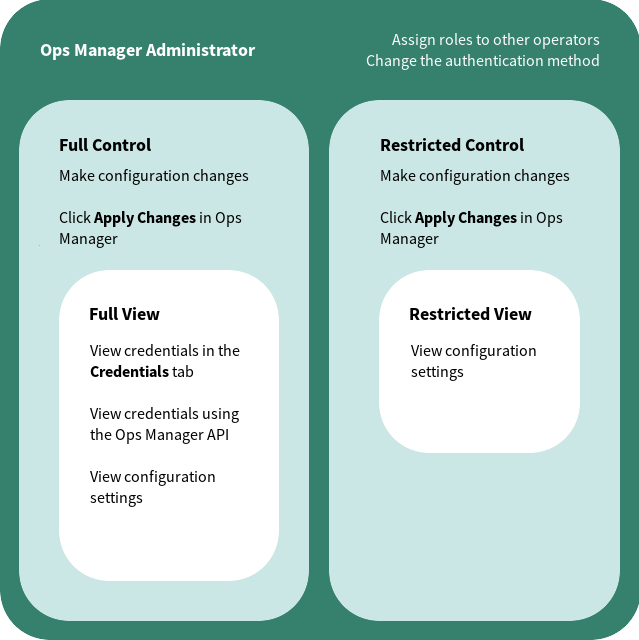 Ops Manager administrators can use the roles defined in the diagram above to meet the security needs of their organization. The roles provide a range of privileges that are appropriate for different types of users. For example, assign either Restricted Control or Restricted View to an operator to prevent access to all Ops Manager credentials. When you install a new Ops Manager instance, all existing users have the Ops Manager Administrator role by default. To assign one of the above roles to an operator, follow the procedure for granting access using either internal authentication, SAML authentication, or LDAP authentication. Note: Multiple Restricted View and Full View operators can be logged in to Ops Manager at the same time. When you install a new instance of Ops Manager, RBAC is permanently enabled by default. If your organization has operators who are devoted to managing certain services like MySQL for PCF, you can use RBAC to assign those services operators a more restricted role. If you upgrade from an older Ops Manager instance, you must enable RBAC and assign roles to users before they can access Ops Manager. If you do not assign any roles to a user, they cannot log in to Ops Manager. WARNING: Do not assign roles before you enable RBAC. Log in to the Ops Manager dashboard. Click Settings from the user account menu. Click Enable RBAC. When the confirmation dialog box appears, click Confirm and Logout. Enabling RBAC is permanent. You cannot undo this action. When you upgrade Ops Manager, your RBAC settings remain configured. You will not see this dialog box if RBAC is already configured. With new instances of Ops Manager, RBAC is permanently configured by default. If you are upgrading from an older version of Ops Manager and use SAML authentication, perform the steps in this section to enable RBAC. To enable RBAC in Ops Manager when using SAML authentication, you must configure groups in SAML for admins and non-admins and then map the admin group to Ops Manager. Log in to your SAML provider dashboard. Create or identify the name of the SAML group that contains Ops Manager admin users. Identify the groups attribute tag you configured for your SAML server. Perform the steps above in Enable RBAC with Internal Authentication to configure Ops Manager to recognize your SAML admin user group. Note: When RBAC is enabled, only users with the Ops Manager Administrator role can edit SAML configuration. To assign RBAC roles to operators, you must first create user accounts for them. For more information about creating user accounts in Ops Manager with the User Account and Authentication (UAA) module, see Creating and Managing Ops Manager User Accounts. You can assign the roles defined in Understanding Roles in Ops Manager to determine which operators in your organization make deployment changes, view credentials, and manage user roles in Ops Manager. Assign one of the following roles to a user, replacing USERNAME with their username. SAML-GROUP: Replace with name of the SAML group the user belongs to. OPSMAN-SCOPE: Replace with an Ops Manager UAA scope. See the table in Understand Roles in Ops Manager to determine which UAA scope to use. Add new and existing users to the appropriate SAML groups in the SAML provider dashboard. Users must log out of both Ops Manager and the SAML provider for role changes to take effect. LDAP-GROUP: Replace with name of the LDAP group the user belongs to. Add new and existing users to the appropriate LDAP groups in the LDAP provider dashboard. Users must log out of both Ops Manager and the LDAP provider for role changes to take effect.